We truly can improve quality of life when we diagnose early-stage memory loss. 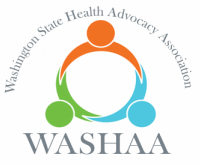 Robin Shapiro, chairwoman of the Washington State Health Advocacy Association (WASHAA), explains how she decided to start her own nonprofit, which focuses on bringing together those who advocate for patient health. "Think about it like this: Would you go to court without a lawyer?" "In times like these, you might want someone in your corner, someone who understands what's going on and can translate often difficult medical concepts into plain English. You might want a healthcare advocate." "Health advocacy...is the act of helping patients assert their choices and rights when they are navigating the healthcare system." "They say that getting old isn’t for wimps. Well, neither is navigating our healthcare system. The financial piece alone can feel overwhelming at times, between the cost of prescriptions, copayments, items that aren’t covered by insurance, and surprise medical bills. Even talking to one’s doctor can be challenging, especially under time constraints. How can you advocate for yourself and find trusted resources when you need them?" The urgent need for health care advocates to fill roles as medical translators or insurance navigators in the community is nothing new, but locating these talented health care insiders and incentivizing action became the topic of discussion at the Washington State Health Advocates Associates (WASHAA) 2nd annual meeting on Nov. 14. Read more. “This is a line of work that is emerging, but we have to go back to the employers and ask, what exactly is this role? Then assess the needs of the industry and align the educational programs with this need. We didn’t want to create a training program for one siloed position, but rather look at it as a career pathway across the industry..." Read more. Learning how to advocate for your own health isn’t just a skill that’s important for people with chronic or life-threatening conditions; it’s helpful for everyone to partner with their doctors and learn how to participate in their own care, rather than think of themselves as passively receiving care. Accidents can happen to anyone, and the all-important work of preventative care should be a lifelong conversation between you and your doctor. Read more. Have you ever encountered a nurse navigator while in a medical situation? Understanding the role of the nurse navigator can have a tremendous impact on the patient. They can have multiple focuses, particularly in patient education. Navigators can be an "extra set of eyes and ears" for the patient, and can be an essential part of the patient's health care team. Navigators can have many names, including Advocate and Coordinator, and the role is pivotal: enhancing the patient experience and improving patient outcomes. Your primary-care doctor can be a gatekeeper for all sorts of specialized care, but there are some things he can't do. Maybe you're dealing with a non-medical issue such as billing, for example, or making a care plan for a loved one. Navigated patients receive a diagnosis in an average of 25 days, vs. 42 days without navigators. These professionals pilot patients through the complex healthcare system. The next time a doctor's office says you have to wait six months for an appointment, or your insurance company gives you the runaround on a big claim, check your corporate benefits plan. "The Yootoons Get Ready for Obamacare" covering many aspects of the ACA to stay informed. When patients receive a diagnosis of cancer, their lives turn upside down. It may seem they are lost in a sea filled with sandbars and overwhelming waves. It is at that time a cancer navigator can become most important.